The Story of Hong Gildong begins long, long ago, with the introduction of a minister of the royal court who has a portentous dream. Realising that it concerns a future child, he’s keen to visit his wife to bring this future a little closer, but unfortunately she rebuffs him. Instead, he visits one of his concubines, and nine months later Gildong is born, the son the minister’s dream foretold. To truly get the full idea of his character, though, you’d have to mix in a bit of Harry Potter and a large dollop of Superman. You see, Gildong is able to magically transport himself between locations, summon up spirits, create doubles of himself (literal straw men for people to chase after) – oh, and fly, of course. He’s not your average bookworm. And so he raised his dagger and cautiously went forth to commit his act, but then he found that Gildong had disappeared without a trace. Suddenly, a fearsome wind blew and thunderclaps shook heaven and earth. The room then transformed itself into an immense field filled with countless rocks, layers of green mountains that soared into the air with intimidating grandeur, and rivers that flowed gently through valleys. An abundance of blue pine trees made the scenery all the more fair. The hapless mercenary is mercilessly dispatched, along with a couple of the other plotters, but sadly the boy realises that those around him have betrayed him, so he decides it’s time to leave so as not to bring trouble upon the rest of his family. The second part describes his stumbling upon his own merry men, the Hwalbindang, who swear fealty to the youth after he proves his worth with a cunning raid on a famous temple. This is just the start of a campaign of terror against the rich and corrupt, and no matter what the authorities try, Gildong is able to avoid them effortlessly. Finally, they come to the point where it’s almost easier to simply concede that he’s beyond their laws. However, Gildong is no mindless criminal. An avid scholar and a follower of Confucian doctrine, he is loyal to his father, his elder brother and the Joseon King. The tragedy of the story, and the impetus for all his deeds, is the fact of his illegitimacy, which prevents him from being recognised and granted the position and affection he craves. In truth, his actions are merely attempts to create a place for himself in society, but he may have to create his own society to be truly accepted. 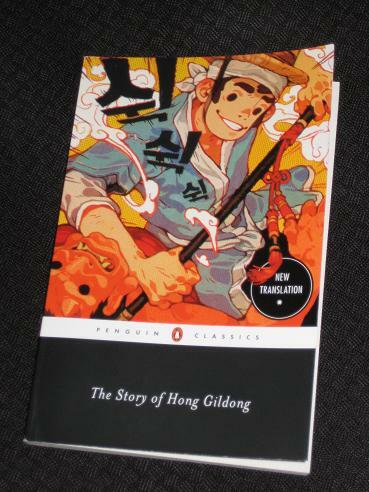 The Story of Hong Gildong is an enjoyable story which will appeal to many readers. It’s wonderfully written (i.e. translated) in an excellent, compelling style, never appearing stilted or clumsy. Kang has got the tone spot on in his translation, crafting a text catching the register of traditional folk- and fairy tales. In fact, even here, there’s a lot that ties it to tales such as those of Robin Hood and King Arthur. While the story is the main attraction, there’s also an interesting story behind the book. Kang’s introduction explores the work’s origins, dispelling the myths behind its creation. The story was long thought to have been written several centuries ago, but research has shown that it probably dates from the late nineteenth century, and the translator briefly discusses the major issues facing researchers of the text, namely determining which of the many versions out there (some short, some long, many with differing details) is the real Ur-Hong Gildong. The book is definitely a very good read particularly with the translator’s comments. Although the point you mentioned “To truly get the full idea of his character, though, you’d have to mix in a bit of Harry Potter and a large dollop of Superman” does rather detract from the narrative tension, as Hong Gildong can get out of any tricky situation with his supernatural powers. And three cheers to the translator for using the more modern Romanization system as well rather than, in his words “the diacritical marks of McCune-Reischauer, which gave transliterations a technical look that is intimidating to readers unfamiliar with Korean literature and scholarship”. Referring to an earlier thread I think use of that system is another problem with the older translations. Paul – I wasn’t too bothered by his invulnerability (I wasn’t looking for novelistic truth with this one! ), but I can see how it could detract from the experience. Still, if you accept that he’s untouchable, there’s still a lot of fun to be had with this. part of that though is a failing of the English language, i.e. that representing the same Korean sounds by consistent English vowels doesn’t produce the same sound in English speaking minds (the 10 pronunciations of ‘ough’ for example). The other approach is the one that a lot of Koreans adopt when romanizing their names, i.e. using something that best approximates an English word, so my wife writes her name 지영 as Jee Young rather than the official Ji Yeong, and the ex Man-U footballer with a very similar name 지성 writes it Ji Sung not Ji Seong. Korean surnames are particularly tricky – Kim, Park or Lee vs. the more ‘correct’ Gim, Bak and Yi? Paul – Yep, Gim is just plain wrong! For me, it’s the long vowel that should be changed (i.e. ‘oh’, rather than ‘o’) – I’d keep ‘o’ instead of ‘eo’!